Jamy from Seay's Kopitiam tagged me on June 27 about my face behind the blog. Well, I think you guys have seen my photos here and there, so I will skip that part. Jamy, I put this photo up so you can see the recent me and Fabien. This is taken during the wedding last weekend. I was born in Klang, Malaysia, went to school in my hometown then university in Kuala Lumpur. After having my BBA degree, I worked for around 6 months in Damansara, then took up an opportunity in Austin, Texas, USA. I worked for around 2 years, during the time I met my French husband. Because of him, I stayed on for my MBA degree for another 2 years after my work contract ended. In 2005 we decided to move to France. I took one year French classes in the local university, and free French classes here and there for another year. 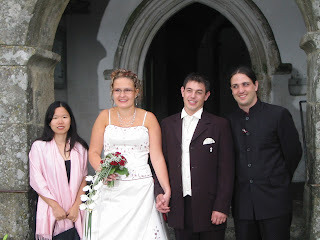 We got our civil wedding done in 2006, Malaysian Chinese wedding in Feb 2007 and will have the church wedding in this coming September. We just bought our first apartment and I will return to university right after the church wedding. Sorry I don't like to tag people, but anyone is welcome to do it if it pleases you. Is your internet back ? Glad to hear from you again ! How are the preparations for your church wedding in September? Yes my internet is back on. Hah, I thought you already knew me from all the postings, I was not secretive about myself. Yes the line is up. As for the preparation, the wedding we attended gave us some inspiration, but in large is my in-laws who handle the wedding, me so tired liao of the one in Malaysia. Actually to tell u the truth, I wish I see more of yr pictures in France than scenery. Scenery is nice, don't get me wrong, but I wish I see more of people kind of pictures too. Like you and Fabien etc. I have posted one photo for you.